Are you looking for your next venue? The Art Church has been publicized as one of the best indoor venues in Hollywood. The Art Church has a grand event hall, amazing acoustics, numerous multi-purposed rooms, one-thousand person capacity, and the enthralling energy of a repurposed historical Hollywood church. The Art Church is one of the most unique venues in Los Angeles. The vintage Hollywood church paired with new age production methods invite all creative talent. Innovative communities and individuals can build ideas and collaborate with other designers. We offer effective workspace for creativity to grow and flourish. Fields such as: artistic design, film, technological development, art education, meditation training, physical training, community programming, and music production have already begun cultivating ideas within The Art Church. Come get inspired through our Community Arts Education program. The Art Church offers engaging classes from renowned teachers of Los Angeles. Drawing, Yoga, Meditation, Tantric Belly Dancing, Paint, Dance, Film, Web Design, are a few of many classes taught at The Art Church. At The Art Church, our mission is to harness the transformative power of creativity. The Art Church is a culture-rich center that recognizes the growing need for a community seeking social change through self-empowerment. Rooted in the heart of Hollywood, the historic and vintage church from the 1920's has been repurposed into a dynamic event venue. Amazing acoustics, layout, and unique energy attract the likes of all creatives. 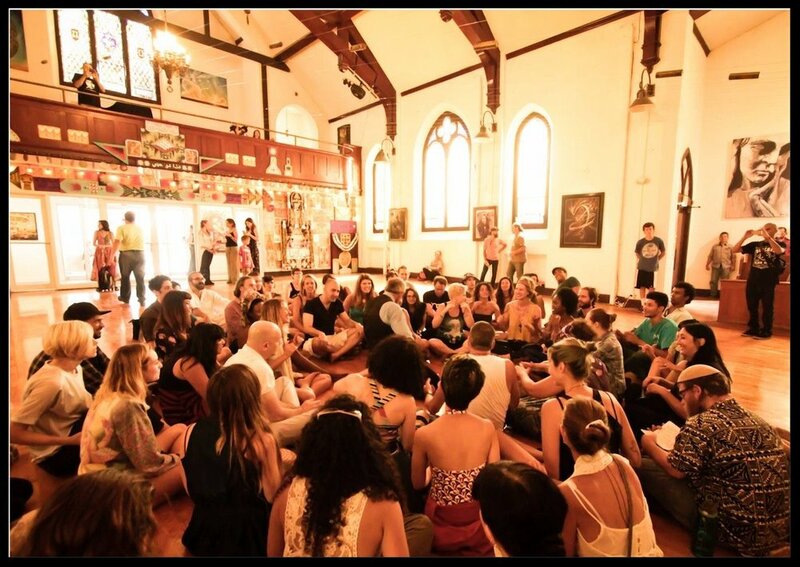 This unique space has an evolving schedule of art exhibits and classes, mindfulness workshops, yoga, group meditations, music events, and much more. We hold space for people from all backgrounds. Daniel is the founder of The Art Church. He is an entrepreneur dedicated to developing an expansive cultural movement. His background as a Los Angeles native immersed in the local art scene, combined with his experience moving between the worlds of commercial and cutting edge creative platforms, is evident in both his restoration of and vision for The Art Church. He fosters emerging artists and innovative public works of art. Daniel previously worked in various departments within the film industry, including commercials and music videos for clients such as Nike, Honda, Rihanna and Lady Gaga. He is a cinematographer with a passion for creating content that has a positive impact. He has years of experience working in arts, music events, films, and festivals. David has been working with business development and concept design at the Art Church since it was first dreamt up with founder Daniel Neuwirth. David is an entrepreneur that actively pursues start-up creative initiatives. He worked as a manager at The Art Church and has devoted his time to developing the underlying concepts and mission that the organization stands for. He traveled and worked in Latin America as a translator and expert travel guide, and started an English school in Brazil. David is fluent in Spanish and Portuguese and has held positions as a web designer, grant writer, and business development consultant. He has a passion for developing platforms that will facilitate the transformative power of creativity. Holly is the in-house Creative Director at The Art Church and has been a core member of the team from its inception. She is responsible for the creative direction, graphic design and visual communications at The Art Church. Her years of experience in graphic design, client relations and event coordinating has made her invaluable to the team. Holly is passionate about all forms of creative expression and using art to empower the individual and further influence society. Los Angeles based Writer and Director, Clay Haskell, grew up on the east coast in a world of art and theatre with family roots that tie back to the founding members of the Metropolitan Museum of Art in New York City. After receiving a fine arts degree from the Savannah College of Art and Design, Haskell's award winning short film "Lyra Lezama" launched his film career in New York City where he spent the next 8 years honing his passion for story telling and his craft in cinematography and where he apprenticed with video artist Tony Ursler and eventually landed on the Emmy award winning hit series "Louie" staring Louie CK. A member of the International Cinematographers Guild, Haskell focuses his efforts on writing, directing and producing thought provoking entertainment that strives to make a positive impact on his community.